After an amazing time spent in Costa Rica and Belize, I set off to the motherland - Mexico. Playa Del Carmen is located in the Yucatan Peninsula, pretty close to Cancun. The ocean waters tend to be much warmer on this side of Mexico since it's near the Caribbean. The small city itself is touristy but the beach was pretty. On my second day, I took a group Catamaran snorkeling tour with a group of tourists to visit Isla Mujeres. The water was unimaginably bright blue. It was a bit cool that morning but felt wonderful in the hot sun. I stayed in a very affordable hostel in the center part of town, just a few minutes walk from the beach. It was in November and I ended up having Thanksgiving dinner by the beach: wine and pizza. Overall, it’s a great place to sunbathe and lounge around with a margarita or if you feel adventurous you can windsurf, jet ski, kayak or go diving. If you're into diving, check out the Underwater Art Museum. You can also take group tours to the nearby ancient site of Chichen Itza ruins. Seeing the UNESCO site of Chichen Itza in person was a dream come true for me. The ancient legends of perfectly aligned temples built by ancient aliens always fascinated me. That was a full day tour by bus. If you want something really unique, you can even swim with Whale Sharks! Now Merida surprised the heck out of me. I honestly hadn't heard much about this town before going to visit. All I really knew was that it had some ancient ruins, so naturally, I added it to my list as I made my way inland. It's a small town probably best known for its ancient Mayan city of Uxmal. The ruins at Uxmal are an UNESCO-listed archaeological site in the Yucatan. You can take tours to the city of Uxmal, and stay for the night show! 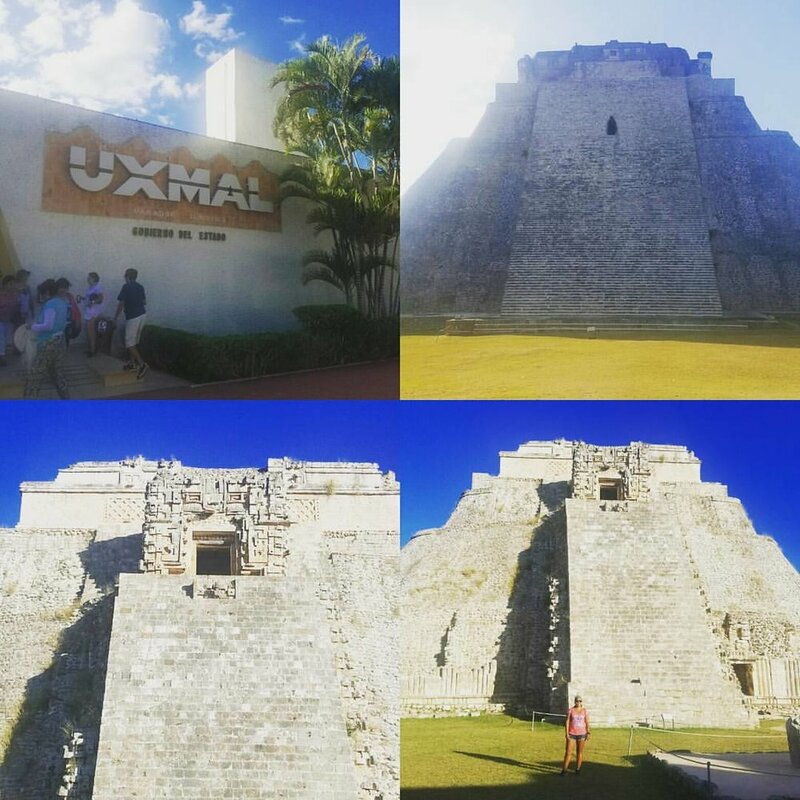 Again, I had barely done much research before going to see Uxmal, but wow was it spectacular and HUGE. It took all day to see the city of ruins. So glad I had comfy walking shoes with me. Merida still has an old world European feel as I'm walking the around town. It’s often said to be the safest city in Mexico. Check out the Great Museum of the Mayan World for a massive collection of Mayan artifacts. Heard of the Mayan Ball Game? Well you can watch players reenact the battle live in front of the Cathedral and Plaza Grande. The Pok Ta Pok, as it's called, event in Merida is free and begins at 8 PM. If you enjoy leisure people watching, hang out at the Plaza Grande, a giant park in the middle of the square, where the city offers free wifi! Cochinita Pibil - the most notable Yucatecan dish, this tender slow-cooked pork is marinated in sour-orange, achiote, and other spices. Also, a chicken version called pollo pibil. Sopa de lima - a hearty soup loaded with shredded turkey in a deliciously tangy broth thanks to the lime juice. Being my mother’s hometown, I felt it was my duty to put this on the list of cities I passed through on my journey. It’s a colonial town with a rich culinary history. Well known for the Cathedral de Guadalupe, legend has it that after the construction of the Cathedral, engineers and architects wondered how to carry a bell of 8000 kilos. One morning, residents awoke to the news that it was already at the top. This legend is responsible for this beautiful city being called Puebla to los Angeles. I highly recommend a day trip to the nearby city of Cholula to visit all of the ancient churches in the city. A great souvenir to pick up will be the famous Talavera tiles. I recommend supporting the small local street vendors, but be wary that your tiles are authentic by taking a coin and firmly striking the tile, if it’s legit it won’t break or scratch it. The MUST TRY local dish is definitely the Mole Poblano! Mole is a sauce made up of different spices and CHOCOLATE. It’s a fusion of Indigenous and European cultures. Mole is a time consuming and labor intensive dish to prepare that requires many ingredients such as different chiles, tomatoes, bread, tortilla, onion, garlic, chocolate, chicken stock, banana, lard, almonds, sesame seeds, salt and spices such as pepper, clove and anise. Chiles en nogada is another popular dish which has a poblano chili pepper filled with “picadillo” and local ingredients such as “manzana panochera” and “pera de leche”. The chili is then dunked in egg batter and fried. Finally topped off with a creamy walnut sauce, pomegranate seeds and parsley. The dish’s three elements generate the colors of the Mexican flag: the green parsley, the white walnut sauce, and the red pomegranate seeds. For a tasty street food try the Chalupas, lightly fried corn tortillas that are topped with salsa, onion and shredded chicken or beef. Typically an order comes with 4 chalupas. It's been a couple weeks into my journey through Mexico. I've been traveling my bus with many stretches being over 20 hours long. Thankfully, the buses are modern and well equipped with comfy seats and TVs. Still, it's been exhausting and I can't wait to get to the big city for some sight seeing nostalgia. La Ciudad, is a wonderfully diverse and huge city with so much to see and EAT! My first couple of days there I stayed at an Airbnb near the central part of the city. I wanted to stay in a convenient location with easy to find transportation. The couple I stayed with provided a nice private room with a balcony. I wanted to also make sure I was staying in a neighborhood filled with locals rather than a tourist trap area. I spent my first night walking around the area and exploring where to find some yummy food. There happened to be a local outdoor market nearby with all kinds of goodies. They were mostly selling holiday decorations since it was the beginning of December but they also had plenty of street food. I could smell the carne asada being grilled for tacos and the sweet smells of baked bread and my personal fav, churros. Just walking through the city brought back so many wonderful memories from my childhood. I was fortunate enough to have my older cousin meet me for a fun day of sightseeing. We took a bus to the main square aka the Zocalo. It was used as a ceremonial center in the Aztec city of Tenochtitlan. Today, it’s formal name is Plaza de la Constitucion. This morning, it was packed with tourists from all over the world and locals wandering around taking photos. Then we walked to begin our tour of some of the biggest museums in the area. Tempo Mayor, according to Aztec legend, was considered the center of the universe, so naturally it was our next stop. A UNESCO site, the construction of this main temple first began in 1325 and it was rebuilt six times, then destroyed in the Spanish conquest. This site was thought to be the exact spot where the ancient god gave the Mexica people his sign that they had reached the promised land: an eagle on a nopal cactus with a snake in its mouth. The museum itself has a vast collection of artifacts for viewing. They also do short reenactments of certain ceremonies throughout the day. The rest of my time in la ciudad, was spent visiting my cousins and telling them all about my travel adventures. Whale watching, tequila tours, surfing, boat tours, snorkeling, shopping, festivals, and of course - day drinking. I happened to arrive in P.V. on the week of a major holiday celebration - Guadalupe processions is a 12 day long event. On the 12th of December, “Guadalupe Day”, is when it all culminates and all those around the city walk in the parade to the main Cathedral de Guadalupe. There’s dancing and music and lots of celebrating. Whale watching season is from December to Mid-March and I had the pleasure of going on my first whale watching tour. We saw about 7 different whales that day, it was amazing because we were close enough to not need binoculars. All The Rooms, has a great resource and provides a rundown of the very best beaches in Puerto Vallarta, suitable for travelers searching for a little luxury, a family getaway, or a respite from working life. Check out more info here: Best Beaches in Puerto Vallarta. Drag show and GASP, Jay Rodriguez right behind me! You mustn't miss the shows! Even if you're not a big fan of musicals or drag shows, just stop in for one show, I promise they won't disappoint! If you are a fan of the gay culture, then you might even get to see a celebrity like Jay Rodriguez! For an even less crowded and hippy feel, check out the tiny surfer town of Sayulita. You can take a bus from the mall in P.V. it’s about an hour ride to the beach town. Tell the driver where you want to stop and he will announce it once the bus arrives. It's about a 10 minute walk to the center of the town, just follow the crowd and the smell of the ocean. Jul 20, 2018 What Is Ecotourism And Why Should You Care? I had a blast getting in touch with my roots, drinking tequila and gorging on all the fantastic local dishes. Have you been to Mexico yet?